Pond Size, how big is it? Thank you for visiting Lilpad Gardens. Back in 1996 we purchased this home on 2 acres of land (the back half was all wooded.) I decided to have it logged off. When the loggers were done there was a big hole in the back yard. I envisioned what would be a great spot for a pond someday. As I cleared the land of the under brush and other small trees that had grown over the last 12 years, I started to get this vision and it went beyond just a pond. It grew into a project that lasted all summer and continues to this day. The links above will take you to the plants and fish we sell. There are also links to useful information on planning your pond or water garden. Let me tell you before you get started here: I am no expert and don't claim to have all the answers. The information on these pages is from trial and error and lots of reading. 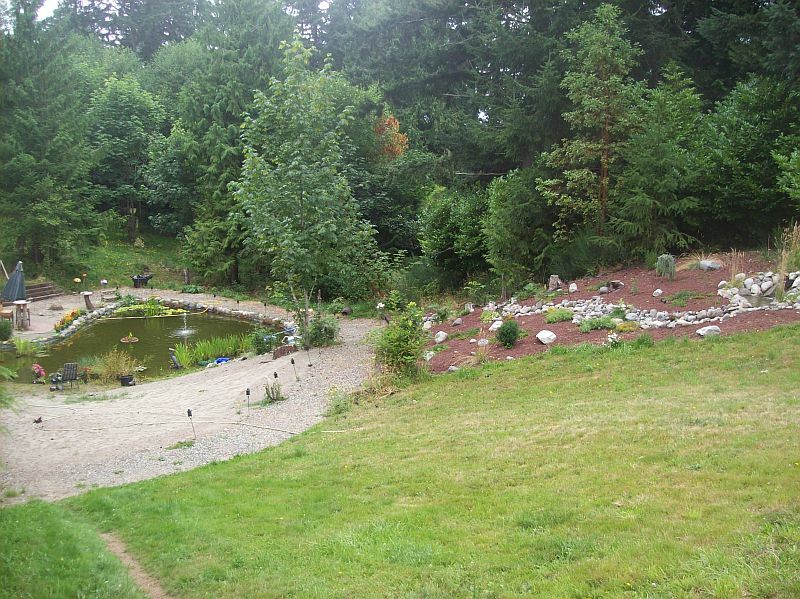 Before you get started on your pond or water garden plan everything out first. I can't emphasize that enough or you will be doing things more then once, you can trust me on that. Feel free to contact us with Questions, Comments or suggestions. We will reply to e-mails as time permits and to the best of our knowledge. We are located in Port Orchard, Washington. Sorry, but at this time we do not ship our fish. Feel free to use any information you would like from our website; just remember to give credit where credit is due. Thank you!